Young Texan Mama: Hooray It's Done! I am very excited that I finally got this quilt finished up! Not only was it my July goal for the A Lovely Year of Finishes, but it was also one of the longest members of my WIP pile. I started the 2012 Craftsy Block of the Month around the beginning of the year, and I got really excited about it and made several blocks right away. Then I started something else and the blocks ended up in a box, so the project sat for a while. This is the largest quilt that I actually quilted on my own, and I was terrified through most of the process. 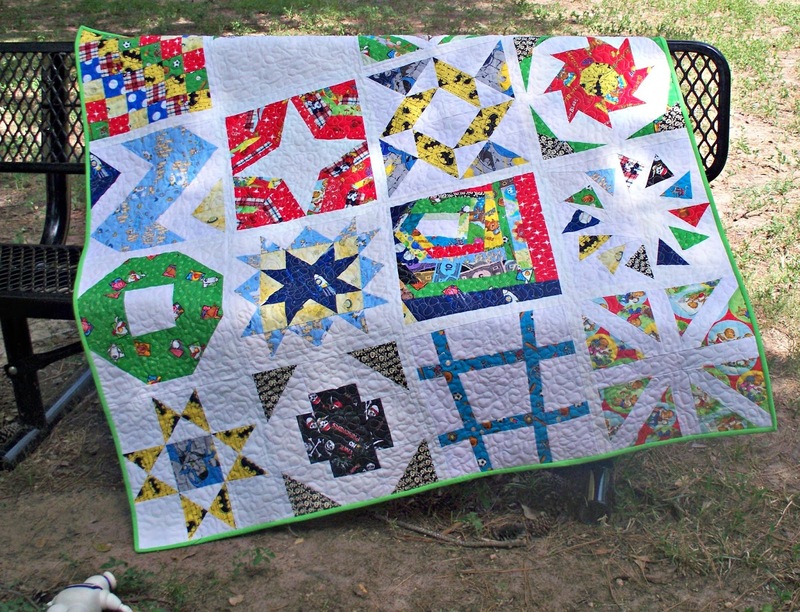 At first I was tempted just to send it off to be long-armed like the last quilt I made. 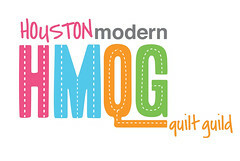 But I decided if I keep putting off tackling free motion quilting then I would never learn how to do it. So I took the beautiful Aurifil thread I got from my HMQG meeting and dove in head first. It only took me about 3 hours to run out of my first spool of thread. Since it was 3am I had to wait until morning to go and get more :( but I did and got back to work the following evening! The quilt god must have been looking over me too because literally as soon as I finished quilting my machine warned me that my bobbin was running out! Halleluiah! Last but not least was the binding. The usual place I like to get fabric from is almost an hour drive from my house, so I was pretty stumped while walking around Joann's looking for binding. Then I stumbled upon the Kona Solids and William picked out the vibrant Kona Sour Apple. :) I love it, and I love it even more that he picked it out. This Batman block is one of my favorites. Most of the fabric I used for this came from my scraps and stash. I did go out and buy a couple of fat quarters here and there though. Fabrics: Assorted novelty fabrics from stash & Kona bleached white. This is soooo impressive! I love the sweet little boy fabrics you used, and this seriously looks straight out of a magazine. It's so perfect! This is a lovely finish. William will love using it! what a cute quilt! bravo to you for jumping into FMQ. Your stippling looks great! I'm sure your he will love it for years and years. I just love your quilt. It is perfect! And your quilting looks terrific! Great finish! I am visiting from Sew Cute Tuesday and Fabric Story . I also signed up to follow through bloglovin. I love the colors against white! I want to make a quilt with this combination! Thanks for the inspiration. This is so cute. I used that same Batman fabric to make my son (at college) some potholders because he adored Batman as a kid.